Murder by Gaslight: Did Ida Do It? Mrs. Ida Quinlan and her 9-year-old son Johnny went out to buy a pair of stockings at around 9:00 the night of February 1, 1896, leaving her baby in the care of her sister, Mrs. Sophia Grant. They took a streetcar to the store, several miles away, purchased the stockings and other sundry items, returning to the house at around 11:00. Ida rang the bell but there was no response, so she went the landlord who lived nearby and got a key to the house. Entering the sitting room, she was surprised to see the drawers of the chiffoniers pulled out and the contents spread on the floor. She called for Sophia and getting no response went into the kitchen where she found her sister lying dead on the floor, covered with blood. Horrified, Ida ran from the house to seek assistance from the neighbors. At least that was the story she told the police. The following day Ida Quinlan was arrested for the murder of her sister. They lived in a three-story tenement in the Charlestown section of Boston. It was a two-family home but at the time Ida Quinlan and two children shared the house with her sister Sophia Grand, and their brother Angus McLeod, a conductor on the New York, New Haven & Hartford Railroad. They also took in lodgers; John Thompson a brakeman on the same line as Angus had a room there. Sophia had married B. W. Grand three years earlier but after a few months, they decided that they did not want to live together. She stayed in Charlestown and he lived in Providence, Rhode Island where he had a dry goods business. It was said Sophia and her husband were on friendly terms and corresponded frequently. Dr. O’Brien examined the body for the police and determined the Sophia Grand had been struck in the head several times with a blunt object, fracturing her skull. She was wearing nothing but a nightdress and stockings but had not been sexually assaulted. There were no signs of a struggle but a rocking chair in the kitchen was overturned; she was probably struck while sitting in it. Robbery was thought to be the motive, but no one from the house could say that anything was missing. Ida thought Sophia kept $25 in one of the drawers but that could not be confirmed. The doors had been locked when Ida returned and there were no signs of forced entry. It could have been one of the residents of the house but everyone with a latchkey had an alibi. It might have been a former lodger who kept his key, or possibly the killer had climbed a drainpipe and entered through a broken window on the third floor. But the police did not think it was necessary to go so far afield; Ida Quinlan’s story did not stand up to close scrutiny. The police had several reason to suspect Ida of the murder: she had a record of violence having been charged with assault and battery three months earlier; Ida’s husband David had moved out due to her bad temper and drinking habits; she was the last to see the murdered woman and the first to find her dead; she could not explain why she left the house after 9:00 and traveled so far to make a purchase that she could have made at a store near her home; it was unusual for her to keep her 9-year-old boy out past 11:00; after finding the body she ran from the house without first checking on her baby; their guard dog, a large black Newfoundland named Fred, gave no indication of being disturbed by an intruder. 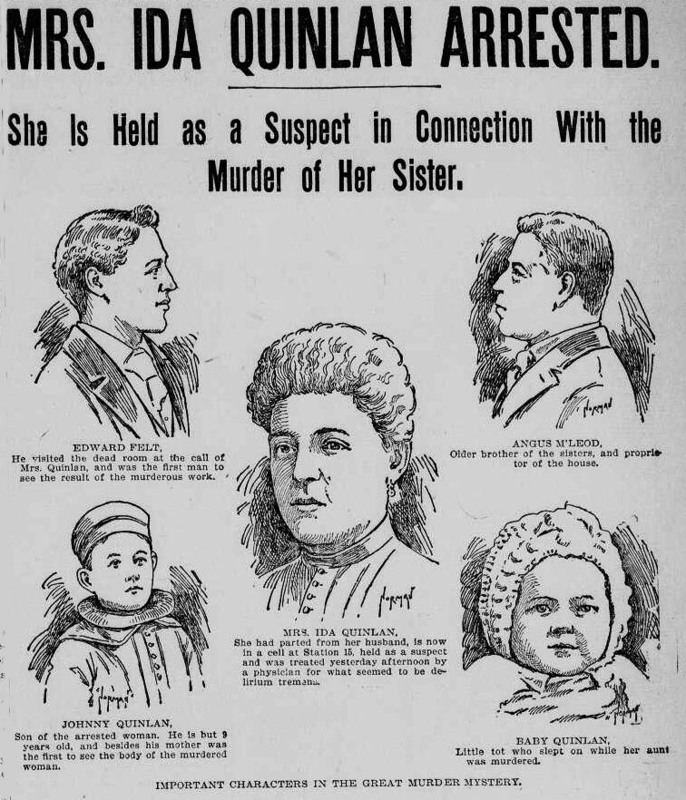 The police were convinced that Ida Quinlan was guilty and arrested her for the murder of her sister. 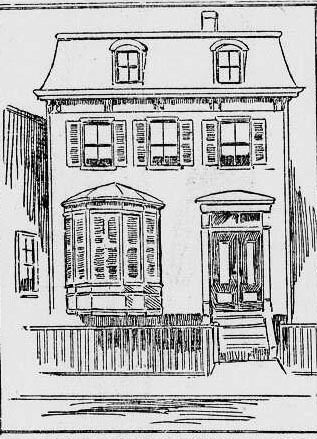 House Where the Murder Occurred. Additional evidence was gathered. Dr. Wood, of Harvard University, who did forensic analysis for the police, examined the dress Ida wore and found blood—not in blotches which might have resulted from touching the body after death, but small spots as if spattered. Her mackintosh, shirtwaist, and shoes also had spots of blood. 9-year-old Johnny Quinlan, when questioned, said he had been by his mother’s side all night, but the police found witnesses who contradicted this. At 9:00 a delivery man came by with a dozen bottles of beer Ida had ordered. Normally he would have carried them upstairs for her, but this time Ida carried them herself. While she was inside, William D. Doughty, a tailor on his way to his shop saw a boy standing alone on the street, he recognized him as Johnny Quinlan and said hello. Ida and Johnny had been seen apart long enough for her to have murdered Sophia. The biggest problem for the police was the absence of a motive for the murder. Relations between Ida and Sophia were cordial. There were no recent arguments or long-standing feuds between them. It was said that they disagreed on religious matters but not enough to incur violence. Ida would not benefit financially by her sister’s death. There appeared to be no reason for Ida to kill her sister. In spite of this, the police were ready to take their case to the grand jury. Without a motive, it was doubtful that Ida would be indicted for first-degree murder, but the police were sure she would be charged with second-degree murder or at least manslaughter. But the grand jury was not impressed by the evidence against Ida Quinlan and did not return any indictment. The Boston Police found no more evidence against Ida Quinlan or anyone else in the case. The murder which made sensational headlines in February was all but forgotten in March. Sources: “The End near,” Boston Journal, February 5, 1896. “Ghastly Crime,” Boston Herald, February 2, 1896. “Human Blood on Her Dress,” New York Herald, February 6, 1896. “More Red Spots,” Boston Herald, February 6, 1896. “Mrs. 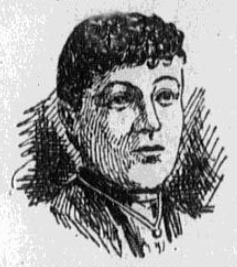 Ida Quinlan Arrested,” Boston Post, February 3, 1896. “Murder Mystery Still Baffles Police,” Boston Journal, February 4, 1896. “No Bill in Quinlan Case,” Boston Journal, March 6, 1896. “Son Talks,” Boston Journal, February 4, 1896. “Still a Mystery,” Boston Daily Advertiser, March 9, 1896. Murder never eludes God's witness...whether in this Life, or in Death...He serves justice. The Act of a Mad Man.